We are well into the Spring season and before we know it Summer will be upon us, so make sure that you are well prepared to introduce lots of splashes of colours, scents, butterflies and bees into your garden by buying your bedding from Longacres, where we have hundreds of different varieties to suit every type of gardener and garden! Antirrhinums, Petunias, Geraniums, Fuchsias, Impatiens, Lobelias, Marigolds and Nicotianas are just a small example of the bedding plants available to buy both in store or online from as little as £1.39 in a 9cm pot, £1.99 as a 6 pack of boxed bedding, or just £2.99 as a 12 pack of boxed bedding. 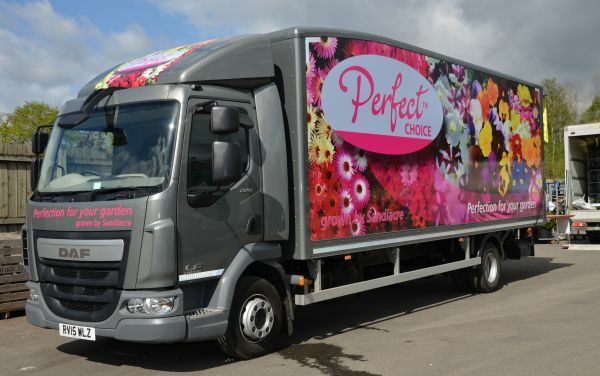 Our grower of bedding plants, Perfect Choice, have invested in a stylish, bright and bold new delivery van to transport all of our bedding plants to us ready to offer to you! Perfect Choice is a small family run nursery just 8 miles down the road from us in Locally grown plants have lots of advantages; it means less of a carbon footprint, plants are as fresh and perfect as they come, we save on distribution costs (which means a better price for you, our customer! ), and finally we are supporting the local economy and of course another family run business - just like ours. Visit us in store to view the full bedding range, or click here to view the online range. Please note when buying online that you can mix and match all boxed bedding but the total number of boxes must be a minimum of 6.